A Pakistani border security guard stands alert at Pakistan-Afghanistan border post, Chaman in Pakistan, May 5, 2017. The U.S. recently decided to withhold $50 million in military aid to Pakistan for failing to do enough against the Haqqani network. An Afghan defense official told VOA that the recent spike in violence in Afghanistan is not the work of the Islamic State terror group. 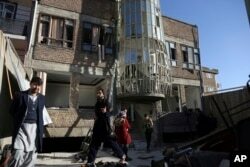 Rather the Pakistan-based Haqqani network is behind the attacks, he said. General Mohammad Radmanesh, a spokesperson for the Afghan Ministry of Defense, told VOA the Haqqani network, a U.S.-designated terror group, has been carrying out attacks under the name of the IS terror group. FILE - Armed Taliban fighters are seen at an undisclosed location in Nangarhar province, Afghanistan, Dec.13, 2010. 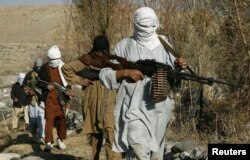 Taliban fighters are currently engaged in clashes with Islamic State militants in the region. However, the Afghan general did not rule out the presence of IS in Afghanistan. He said IS does have footprints in the country, but U.S. and Afghan forces have seriously undermined the terror group’s abilities through military operations. “Afghan security forces have cracked down [on] IS in a number of provinces and have caused them massive casualties in Nangarhar province [IS’s traditional stronghold],” Radmanesh added. Without specifically naming countries, General Radmanesh blamed the intelligence agencies of regional countries for trying to portray IS in Afghanistan as a potent and powerful terror group. The Islamic State group in Afghanistan is not linked with the main Islamic State group in Iraq and Syria, he added. Experts are divided over who the members of the Islamic State in Afghanistan are and whether the Haqqani network and other terror groups have rebranded themselves as IS in the country. Some security experts like Atiqullah Amarkhil push back against Radmanesh’s claims and argue that shifting blame from IS to Haqqani does not solve the problem nor does it reduce the severity of the security problem Afghanistan faces. “We should not deceive our people by stating that Haqqani is behind the attacks, not IS. They both are,” Amarkhil, a Kabul-based retired general, told VOA. “IS is more active and trying to spread fear and create a gap between government and citizens,” Amarkhil added. 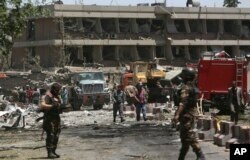 FILE - Security forces inspect the site of a massive suicide attack that killed more than 150, according to the Afghan president, in front of the German Embassy in Kabul, Afghanistan, May 31,2017. A letter drafted by a senior Islamic State militant points to a growing power struggle within the group’s Afghan affiliate. Abdul Wahid Taqat, another security analyst and a former senior intelligence official in the Afghan government, agrees with Radmanesh and maintains that IS in Afghanistan is comprised of members of various banned Pakistani groups. Michael Semple, an expert on Afghanistan at the Senator George J. Mitchell Institute for Global Peace, Security and Justice, believes that the Afghan branch of the Islamic State does not have the capacity to carry out the types of sophisticated terror attacks that were carried out in recent months in Kabul. “Within the Taliban, the Haqqani network have the main responsibility for attacks in Kabul and they have produced plenty of propaganda videos to show their men in training for suicide operations,” Semple said. There are also fears that by targeting Shiite minority in Afghanistan, IS wants to trigger a sectarian war in the country. The Islamic State, however, has claimed responsibility for a number of deadly attacks in different parts of Afghanistan in recent months, including the capital Kabul, sparking fears among Afghans that the terror group might be gaining strength. The terror group has claimed responsibility for dozens of deadly terror attacks across the country since its emergence in eastern Nangarhar in 2015, including a suicide attack on protesters in Kabul in July 2016 that killed about 90 people and wounded another 400. In October 2017, a suicide attack on a mosque in Kabul killed at least 56 people and wounded more than 50 others. IS claimed responsibility for that attack as well. In December 2017, IS claimed responsibility for a suicide attack inside a Shiite cultural center in Kabul, which killed at least 41 people and wounded more than 90 others. In early January of this year, the terror group claimed responsibility for a suicide attack that struck a convoy of the Afghan security forces in Kabul, killing at least 15 people and wounding dozens more, including security forces. FILE - Afghans gather in front of the Shiite cultural center after a suicide attack in Kabul, Afghanistan, Dec. 28, 2017. General Radmanesh said he believes that the increase in violence in Afghanistan has roots in Pakistani-based religious schools. “The reason that terrorism still exists in Afghanistan, although Afghan forces have killed thousands of them, is the madrasas [religious schools] on the other side of the Durand Line [border line separating the two countries] that produce terrorists,” he said. Radmanesh added there are an estimated 10,000 religious schools operating in Pakistan. Some of which, he claimed, train militants for jihad in Afghanistan. Afghan officials have long accused Pakistan of turning a blind eye on terror groups that train on its soil to carry out terror attacks across the border in Afghanistan and that the country is selective in its crackdown on terror groups. Pakistan denies that accusations and maintains that its military operations have targeted militants indiscriminately. “Military-led counterterrorism operations have targeted terrorists indiscriminately including Haqqanis at a heavy cost of blood and treasure,” Pakistan army spokesperson Major-General Asif Ghafoor told VOA following an announcement by the Trump administration that it wanted to suspend hundreds of millions of dollars in military assistance to Pakistan until the country takes “decisive action” against the Afghan Taliban and the Haqqani network. VOA’s Afghanistan service also contributed to this report.